At her heaviest Kim Benson weighed 350 pounds and tried almost every diet available until she was finally able to find something that worked for her. In her book, Finally Thin, she chronicles her personal weight loss transformation as she lost 212 pounds and dramatically reduced her cholesterol levels. This book is offered as a companion program that can be used with the diet of your choice. It features the ten steps that Benson equates with her success, explaining exactly how she finally achieved her goal to lose weight. The book includes a “Diet Quiz” where readers answer practical questions to help them determine what their needs are. Also provided is a section where Benson summarizes thirty of the most popular diets on the market today. Some of the factors highlighted as being important for losing weight and keeping it off include writing a food journal, eating for health rather than just weight loss, and planning ahead. An entire chapter is devoted to the subject of goal setting. Also included are over seventy low-calorie recipes as well as a list of guilt-free grocery items. Fruit, vegetables, Kim’s light bread, whole wheat pasta, nonfat milk, fat-free yogurt, egg beaters, fat-free cheese, chicken breast, turkey, pork tenderloin, kidney beans, cannelini beans, salsa, soy sauce, fat-free mayonnaise, fat-free salad dressing, walnuts, cocoa powder, sugar-free pudding, Splenda, fat-free cooking spray. Kim Benson recommends a combination of aerobic exercise and strength training as part of a healthy weight loss lifestyle. She says, while it is possible to lose weight without exercising, there are many other benefits you can gain by keeping fit. If you don’t enjoy exercise you should start with a small amount each day, but it is important to make physical activity a part of your daily routine. Finally Thin! : How I Lost More Than 200 Pounds and Kept Them Off–and How You Can, Too retails at $14. Can be used as a companion to any other weight loss program. Dieters have the freedom to choose a diet plan that appeals to them. Kim Benson has successfully lost weight and maintained her weight loss. Many readers will find the stories of successful dieters inspirational. Finally Thin includes over seventy recipes. Not written with male readers in mind. Emphasizes low-fat dieting, which may not work for everyone. A majority of the recipes contain wheat and dairy products so are not suitable for those with an intolerance to these foods. 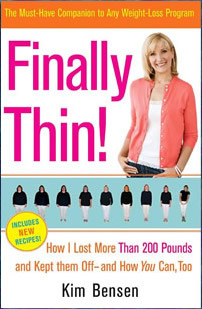 Finally Thin is a combination of a weight loss memoir with a ten-step program by Kim Benson and it can be used in conjunction with any diet plan. This book can be a valuable introduction to the basic principles of weight loss for those who are new to dieting and will appeal to those who prefer the flexibility to choose a plan that most appeals to them.